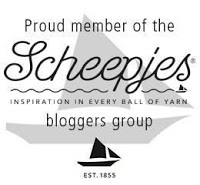 When I thought about designing something with my very own Scheepjes Our Tribe* colorway (Felted Button), I knew that I needed to 1) make something that is authentically ME, and 2) make something that I would actually wear. You can read a bit about my design process here and here, but I'm here today to share with you the free crochet pattern for my Find Your Tribe Scarf. I made my scarf with 2 balls of Scheepjes Our Tribe* in the colorway Felted Button (#965, 70% Merino Superwash/30% Polyamide; 100g/420m), but you can use any of the colors that suit your fancy. In other words, "Find Your Tribe". 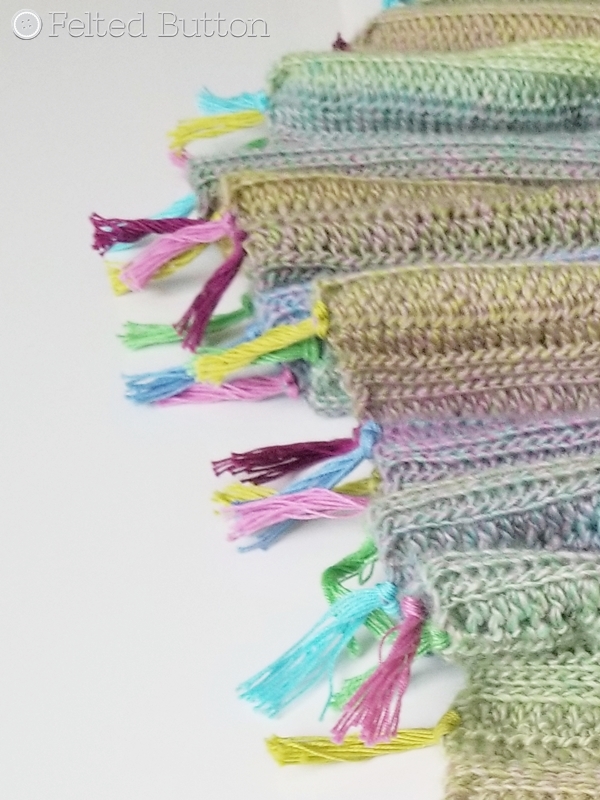 And then the tassels were made with 6 colors of Scheepjes Sweet Treat*, namely: #245 Green Yellow, #397 Cyan, #750 Bordeau, #128 Tyrian Purple, #510 Sky Blue and #513 Spring Green. 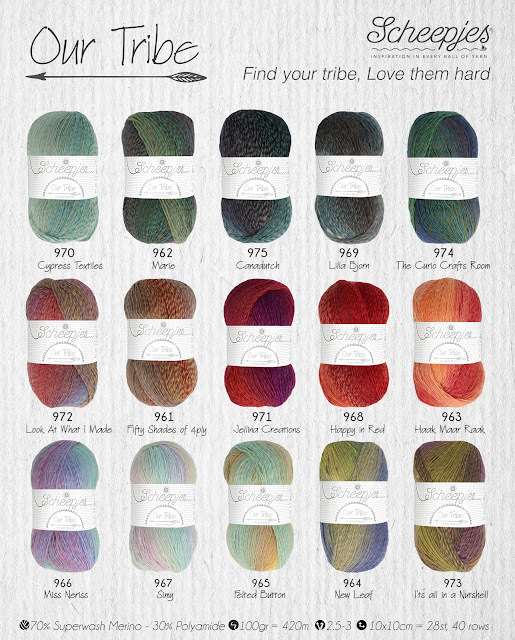 If you use a different colorway of Our Tribe, there are plenty of colors of Sweet Treat from which to choose. See...there are plenty of colors (91) to coordinate no matter your choice. And you can always leave off the tassels if you wish to be a little more subdued than I am. I also used a 4mm hook and gauge is not critical. 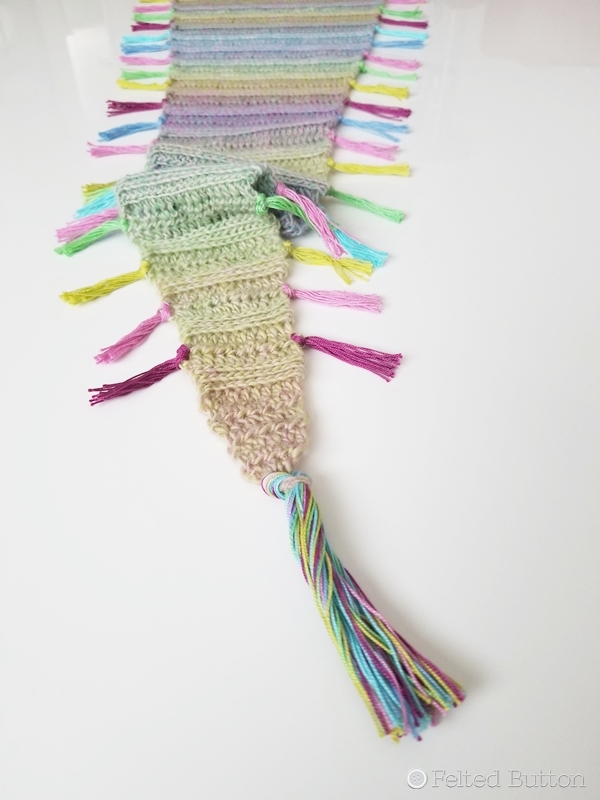 If you are a tight crocheter, particularly if you are new to slip stitch crochet, you might want to go up to a bigger hook--because the tendency is to work them too tightly. So relax, take a sip of tea, and let's begin. My scarf measures 85" (216cm) long and almost 10" (25.5cm) wide at its widest point. ~The ch-1 at the beginning of a row does NOT count as a stitch. 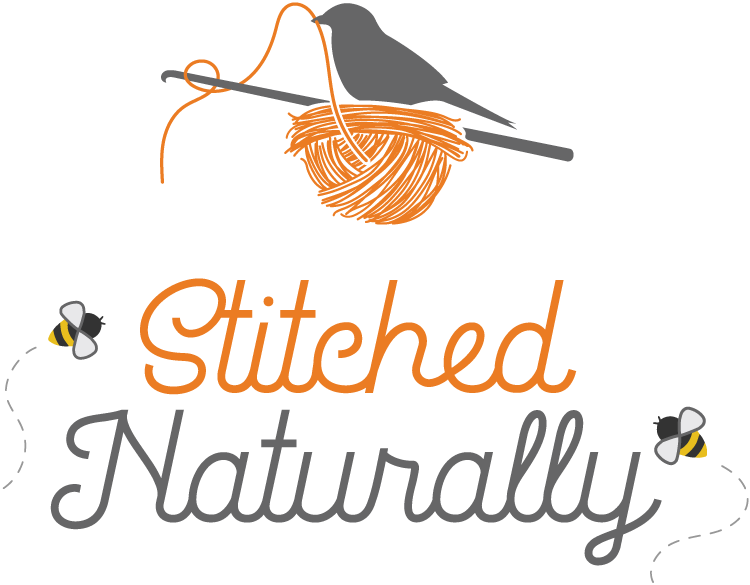 ~Work your slip stitches loosely! They will always be worked in the back loop only. The edges will be tidier if you always begin with a slightly tighter ch 1 to start each row, and if you always turn your work in the same direction. ~Using a stitch marker to mark the edge of where Row 13 and its repeats end will allow you to keep track of the slip stitch rows more easily since they can be tricky to count. ~The scarf is worked beginning at the tip of the scarf in turning rows, increasing to its widest point before decreasing back to a point. Tassels are then added along the edges and at the tips of the scarf (optional). Rows 10-13: Rep Row 9. Rows 17-24: Rep Rows 9-16 until 23 times or until there are 59 sts. Rows 25-29: Rep Rows 9-13. Rows 2-3: Ch 1, hdc in each st across, turn. Rows 4-8: Ch 1, working in blo across, sl st in each st, turn. Rep Rows 1-8 23 times until there are 11 sts. I blocked my scarf before I added the tassels. 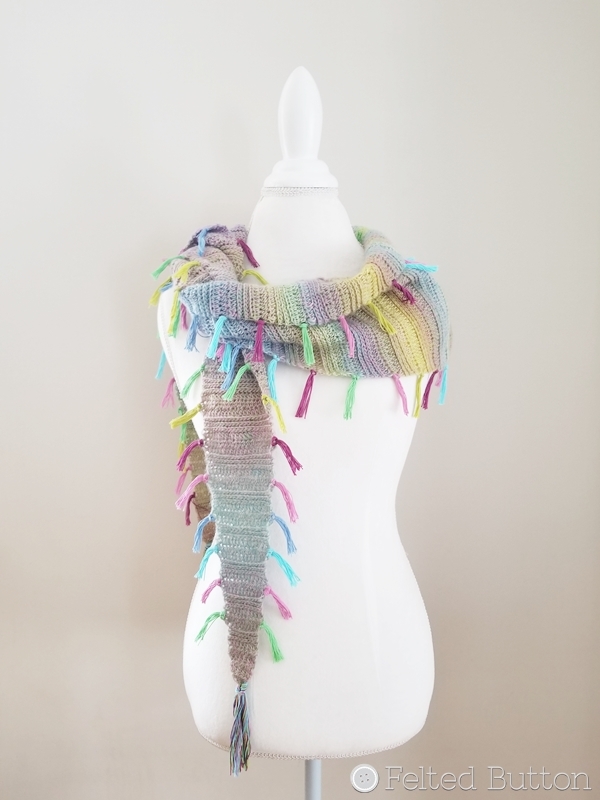 It really gives it such a nice professional finish and is super easy--especially since the yarn is superwash merino and there are no worries with it getting wet. Follow the link here to see how I wet block. To add the tassels I cut seven 5" (13cm) lengths of Sweet Treat. Then at the center section between the slip stitch "stripes", I attached the tassels around the hdc posts at edges. 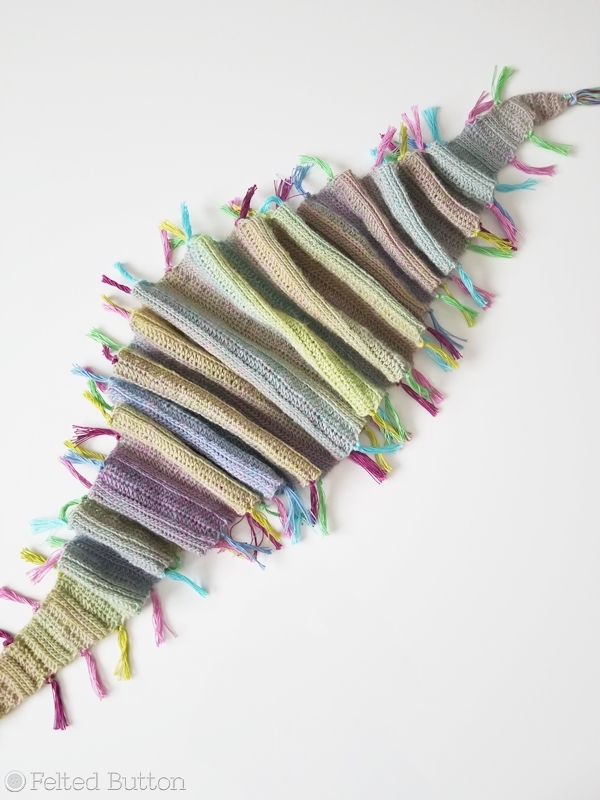 Fold the lengths of yarn in half. Then insert the folded loop through the edge. Bring the tails through the loops and pull them to tighten. Then I trimmed them evenly. Since the scarf doesn't really have a right or wrong side, it doesn't matter which side faces up while you do this either. The colors were added randomly--I just tried to coordinate with a color in that section of the yarn. Doesn't this Our Tribe yarn have some lovely color changes? At the scarf tips, I used several strands of each of the six colors and lengths of yarn about 8" (20cm) and repeated the same process as with the side tassels. I sincerely hope you enjoy your scarf as much as I enjoy mine. It's soft to wear, unique, and can be worn over the shoulders a bit if you wish. If you will, I would love to have you share pics of any of your finished Felted Button projects on my Facebook page here. And you are welcome to follow me around on Instagram (@FeltedButton) and Pinterest, too. Lots of crazy color happening around here! 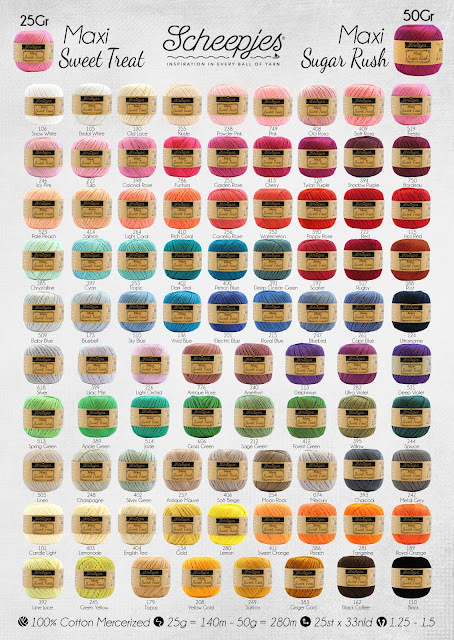 If you would like a tidy, printable PDF copy of this pattern you can purchase one for $2 on Ravelry here, Etsy here or Craftsy here. ...and have a delightfully happy and colorful day!! | On the Board | -- If it doesn't open it's not your door. *This post contains affiliate links. By purchasing through these links it costs you no more but pays me a small commission that allows me to continue providing free patterns. Thanks! Just wondering, why would you use a 4mm hook when the yarn label calls for a 2.5mm - 3mm hook? Was it because of the slip stitches and your tension? Thank you! Yes, with the slip stitching I always use a larger hook. I do that too. The slip stitches can be challenging with a smaller hook. Yes, it really helps whenever I need to work back into the slip stitches. So darn “springlike” & Easter looking! ♥️ Easy to Love. Yes, it is. The colors really brighten my outfit on a cold, gloomy day. Very very loveable and rather funky...like your scarf we each have our own definition of "funky"!! 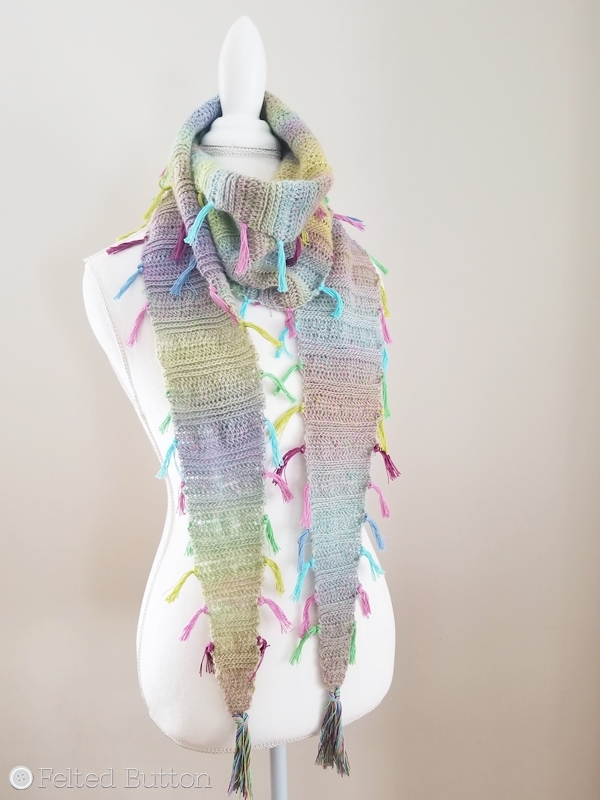 Thank you for sharing this sweet and stunning scarf pattern Susan. Yes, Geri, funky is a personal thing! You are most welcome for the pattern. I hope you enjoy it.